Take That rediscover their mojo on "Progress"
Radio Creme BruleeTake That rediscover their mojo on "Progress"
Very rarely is an album these days released in the midst of a strong wave of anticipation and excitement. Ever since British “boyband turned manband” Take That announced that former band member Robbie Williams had returned to the band after 15 years and that they had recorded their first album as a quintet since 1995’s “Nobody Else”, there was a mass hysteria that swept both the international media and Take That fans worldwide off their feet. a) Musically, Robbie Williams is a very different entity and his influence was bound to manifest itself in the overall sound of the new album. b) Electropop/dance oriented producer Stuart Price (famous for production on Madonna’s “Confessions from the dancefloor” and Seal’s “System”) was at the helm of production. Fans got their first sneak preview of the album around six weeks ago with the airing of “The Flood” (the album’s lead single) on BBC Radio 1 AND Radio Creme Brulee. This mid-tempo track with its soaring chorus features Robbie Williams (lead) and Gary Barlow on vocals. It is hands down the best Take That single since “Never Forget” (1995). The somewhat cryptic lyrics suggest that the song might be about the band’s new-found camaraderie as a quintet. 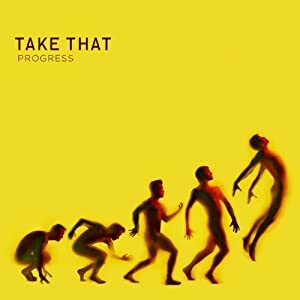 The song acts as a perfect musical bridge between the music of the 4-piece Take That (sans Robbie Williams) and the rest of the material on “Progress” – which is markedly different from “The Flood”. After having listened to the album once, the following observations come to mind. a) The overall “sound” of the album is a mix between that of The Killers’ “Day and Age” and Robbie Williams’ “Rudebox” album. b) Frontman Gary Barlow has taken quite a backseat vocally. “Eight Letters” is the only song featuring solo vocals by Barlow. c) Robbie Williams and Mark Owen sing lead vocals on most of the album. Wait: The track opens with lush string arrangements and suddenly breaks into electronic beats and a catchy verse which slowly blends into a beautiful chorus which features the band harmonizing like they never have. Robbie Williams dominates vocals on the track. “Wait” definitely feels like a track that could have been on Williams’ “Rudebox” album. Eight Letters: This is the achingly beautiful ballad that fans have secretly waited for since “Back for good” (1995). Gary Barlow sings over gentle and lush electronic embellishments which slowly lead to the uplifting harmony-filled chorus. The Flood: A lot has been said about this undeniably brilliant lead single – and hence, by saying more, I would simply be repeating myself. The one song that could have been a highlight is “Happy Now”. Stuart Price has outdone himself with the production on this track – one that you can imagine playing as you get ready to hit the town on a weekend night or while driving along your city’s main drag with the windows down and the car stereo volume all the way up. Unfortunately, the boys decided to go with a mildly robotic variant of their voices as opposed to their actual voices on the verses. This is a significant detractor. Unlike most artists of today, Take That does NOT need a vocoder. I suppose even the best artists need to be forgiven for their artistic misfires which are probably just a result of childish enthusiasm – which is understandable given the recent revival of the band and its fortunes. Given all that has been said so far, one might wonder what my verdict on the album is so far. Well, the radical shift in musical style might have a polarizing effect on Take That fans. Fans of the adult alternative/MOR sound on albums such as “Beautiful World” and “Circus” may not warm up to the album and will almost definitely blame Robbie Williams for his disproportionately large input to the album (although the recent Take That documentary seems to indicate that Gary Barlow is still very much the leader of the pack when it comes to the music). In my humble opinion, Take That has done themselves a huge favor by reinventing themselves. They truly have made “Progress“. A rehash of “Beautiful World” or “Circus” would have spelled the end for them. This would be a shame given that the band is easily one of the biggest success stories in pop music history. Some may perceive “Progress” as a “happy ending” but I see it as the start of new beginnings and musical endeavors. With this album, Take That has single-handedly challenged assertions about the limited shelf-life of a boyband. Boybands as fad-based entities fade but strong musical entities will stand the test of time amidst all the negativity of pop music critics. Take That does not run a risk of becoming irrelevant anytime soon and if they choose to release more albums together, I am all ears. NOTE: Radio Creme Brulee is one of the few American radio stations that showcase Take That’s stellar catalog. Listen to our 24/7 broadcast. You just might get hooked and make it your radio station of choice.